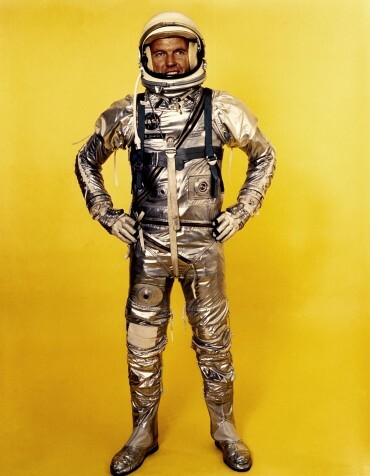 The Cold War-era Space Race didn’t invent the spacesuit. Eleven years earlier, in the March 1948 Astounding Science Fiction, L. Sprague de Camp pondered its history. British balloonists/aeronauts Henry Coxwell and Dr. James Glaisher, also a meteorologist, learned this when, on Sept. 5, 1862, they ascended 5.5 miles. “Glaisher lost consciousness, while Coxwell saved them by opening the relief valve with his teeth” in order to descend. Coxwell’s hands, nearly frozen, were useless, said the website fly.historicwings.com. In 1875, meteorologist Gaston Tissandier flew a balloon “to 28,820 feet, forehandedly taking along a crude oxygen-breathing apparatus.” He still “lost consciousness and his two companions died,” de Camp wrote. As flight technology advanced, protection for pilots followed suit. 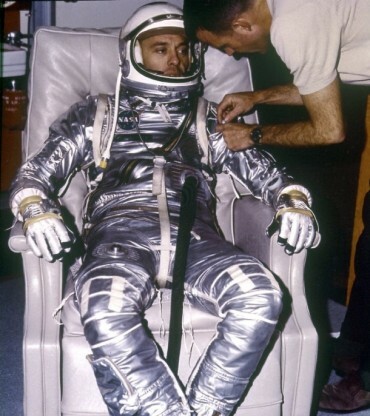 Alan Shepard, the first American in space, is in his Mercury spacesuit (Credits: NASA). Gordon Cooper flew the last Mercury flight in this evolved spacesuit (Credits: NASA). Lt. Clifton McClure wore this partial pressure suit for his 1958 Man High III flight, while he rode in a sealed gondola lifted by a balloon. The suit is displayed at the New Mexico Museum of Space History, in Alamogordo, New Mexico. To show how preservation of such artifacts was not foremost, the museum was told that McClure’s son used to wear this suit for Halloween (Credits: Michael Shinabery/NMMSH). The National Air and Space Museum is undertaking efforts to better preserve the suits that were not designed to last much past one mission. Forty years ago, preservation wasn’t a priority. “Some were displayed under bright lights or left in humid rooms, leading to fungal growth, metal corrosion and degraded plastic,” nature.com said. Old “sweat” is caustic; PVC cooling tubes “have been leaching acidic plasticizer.” Without conservation, the suits will “have only about 20 years left in them.” With the current efforts “they should now last another 50 years” while additional work is completed to extend their lives. Image caption: B.F. Goodrich built this suit for aviator Wiley Post, who is at left (Credits:National Air and Space Museum).